Our second day in McMurdo, Joaquin sent me and Steve an email, urging us to hurry so as not to miss Ladies Night at the telescope. 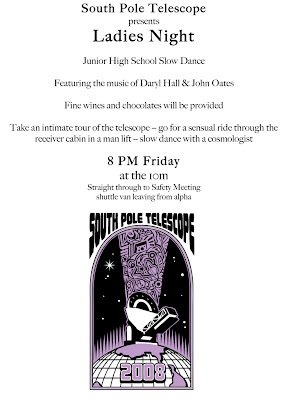 That's right - ladies night, in a telescope, at the South Pole. Complete with junior-high slow dancing. Awesome. By the time we finally boarded a plane, the party had already started. We landed around midnight, and Joaquin met us on the runway with a skidoo to ferry us over and make sure we caught the tail end. All in all, not a bad introduction to the culture here. It is cold at the pole, but not uncomfortably so. 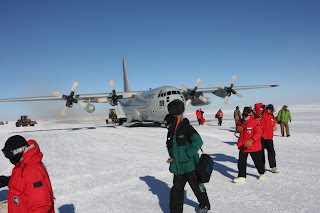 When we landed, it was about -25C, with a windchill of about -40C. The sun was high overhead, and the air was sparkling with ice crystals. Coming off the plane, most people - unfamiliar with freezing temperatures - ducked their heads and made a B-line for the station. I stood around, took some photos, and drank in the crisp clear air for a couple of minutes before hopping on Joaquin's skidoo and hurrying off to the party. Frankly, it's beautiful here. 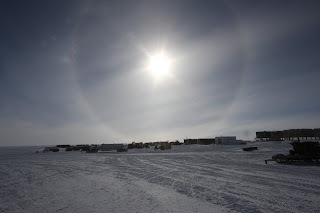 Maybe not everyone's cup of tea - there is no scenery other than the station & associated buildings; just clear flat white to the horizon - but with 24/7 daylight, the almost perpetual "sundog" (like a rainbow, but due to ice crystals, a bit smaller, and usually a complete ring) which encircles the sun, and everything glittering, I simply don't see how anyone would find it bleak here. A couple of hours later, once the party had died down, I made my way back to the station for midrats (the midnight meal for nightshift workers), after which I went in search of my room and stuff. I spent the rest of the night unpacking and trying to settle in a bit. Thankfully, I avoided being stuck in summer camp, a collection of tents behind station to house the excess summer population. The summer rooms on station are pretty tight (there's a tiny desk next to my bed, and you can't leave the room without climbing over the chair), but remarkably well designed. I'd say they're cozy, not cramped.